Introducing international award-winning Brendon Chase as Elvis. 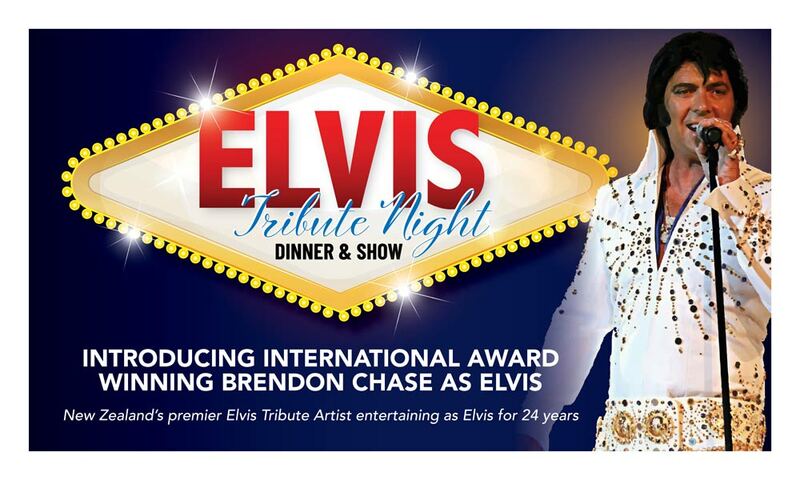 New Zealand’s premier Elvis tribute artist entertaining as Elvis for 24 years. Slow-braised beef short rib with a tamarind and orange glaze and pan seared sweetbread with minted pea coulis, compressed watermelon, parmesan crisps and micro-herbs. Our beef is grass-fed and sourced from Annandale near Ashburton in Canterbury (South Island). Eye fillet is grilled and served medium-rare on maori potato terrine, horseradish creme, steamed baby vegetables and a Mills Reef Shiraz (Hawkes Bay) and wild mushroom jus. The free-roaming Te Mana lamb hails from the South Island high country, is pan roasted to medium and served with a rustic ratatouille, smoked aubergine caviar, baked goat’s feta cheese and mint & madeira jus. A refreshing, delicious & elegant individual citrus set pudding is served with homemade biscuits and fresh berries.